I found the best GF pizza! The good news is I finally found the best GF pizza out there and I didn’t have to make it. The bad news is that it’s in New York City and they don’t deliver this far. Last week in NY with my daughter, I ate my way through the gluten-free plates of the city and boy, are there a lot of them. If we lived in the city, my friends, we would be complaining a lot less about the quality, price, and taste of the gluten-free offerings out there. Seriously. Yes, that’s gluten free. And yes, it was amazing! Ok, that’s fine you say, but what about the pizza? I discovered Keste Pizza and Vino while searching the Internet for GF food. It’s a small place, so small you could miss it and walk right past it if you weren’t paying attention like we did. But it’s worth the walk, and worth the search, trust me. Mondays and Tuesdays are GF days for pizza, although they serve it all week. Mondays and Tuesdays, I was told, are exclusively GF to lessen the cross contamination. Sounded good to me, and since we happened to arrive in the city on a Tuesday, that was music to my ears. It was also egg-free, which made my daughter very happy. The restaurant is tucked into a sweet part of Greenwich Village and conveniently right across the street from a gelato store. There are just a few tables, and I found out later that it can get crowded with a long wait, but we got there early and got lucky. The staff is wonderful, attentive and very friendly. We were seated and had menus and wine right away. Our friends had salads, which they said were very good. I was saving space for pizza. 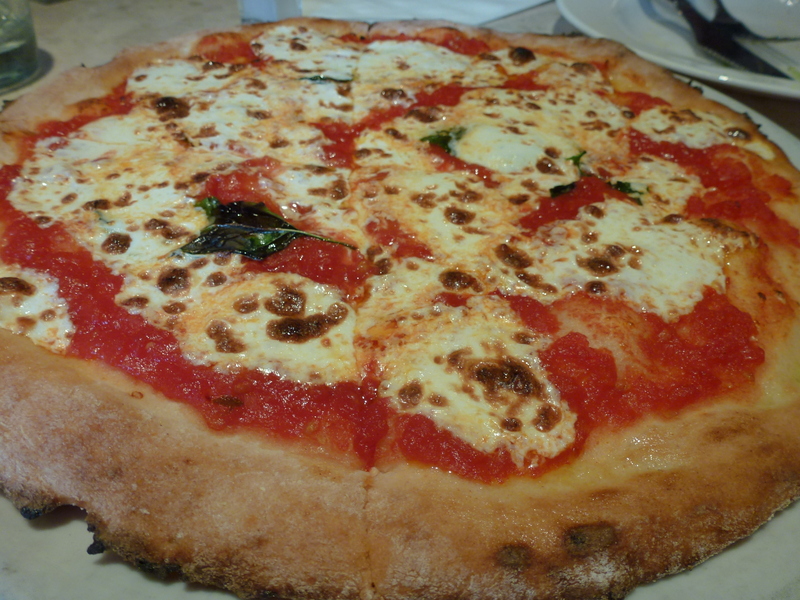 We ordered a basic Margherita pizza to get the full, NY pizza experience and we were not disappointed. It was a full pizza size, not like the usual GF pizza which is so much smaller than regular pizzas (why is that anyway?) And at just $15 I was quite surprised, expecting NY to have a much higher starting price. After taking the first bite of the pizza, my daughter looked at me and said, “We’re gonna’ need another one.” She was right. I ordered two more…one for the table and one for the next day. The four of us devoured the pizzas much too quickly, but we had no control. 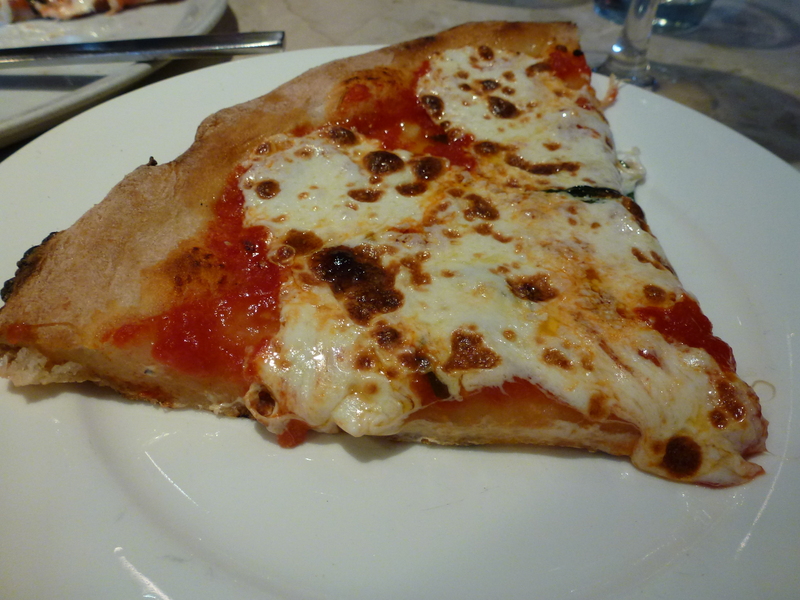 The crust was chewy inside and crunchy on the outside, the sauce was slightly sweet the way it should be, and the mozzarella was fresh and melty. I’m still dreaming of it at night. The cute store across the street, which I loved. We opted out of the flourless chocolate cake to hit the market and gelato stand across the street. Now, I wish I’d had the cake, but I knew I couldn’t eat that much and I would have had no control. The saying, “Well, we’re only here for a short time,” seemed to give us carte blanche to eat anything we wanted, and as much as we wanted. I’m paying the price now, but it was worth it! 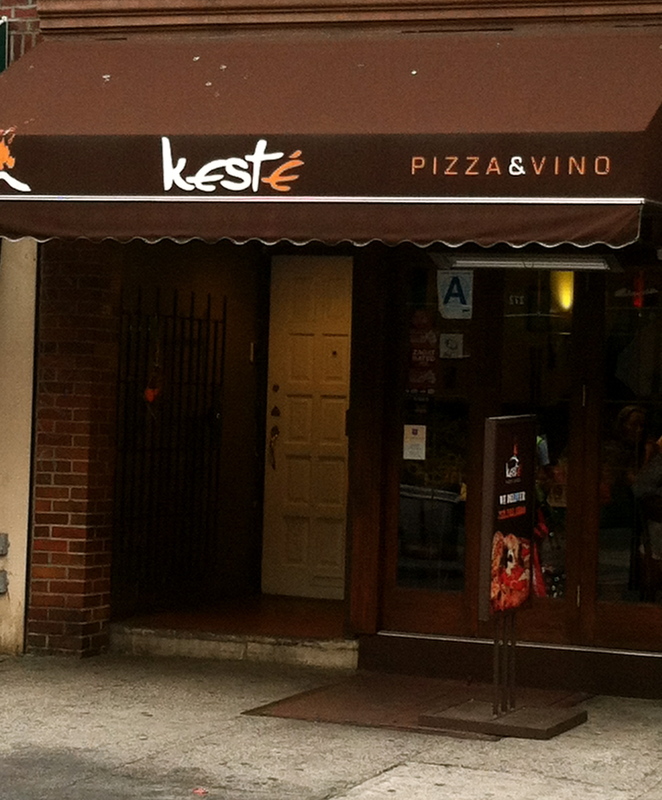 I highly recommend Keste Pizza & Vino and I know I’ll be back again and again, every time I have a chance to go to NY. I like to imagine I’m one of those super wealthy people who can order whatever they want and have it delivered, even if it’s cheesecake from Boston or bagels from New Jersey. I would order this, no question. The pizza is just as good the next day, cold. We packed it in our bags and headed out to Central Park for a day in the sun. Perfect food to munch on in the city, don’t you think? 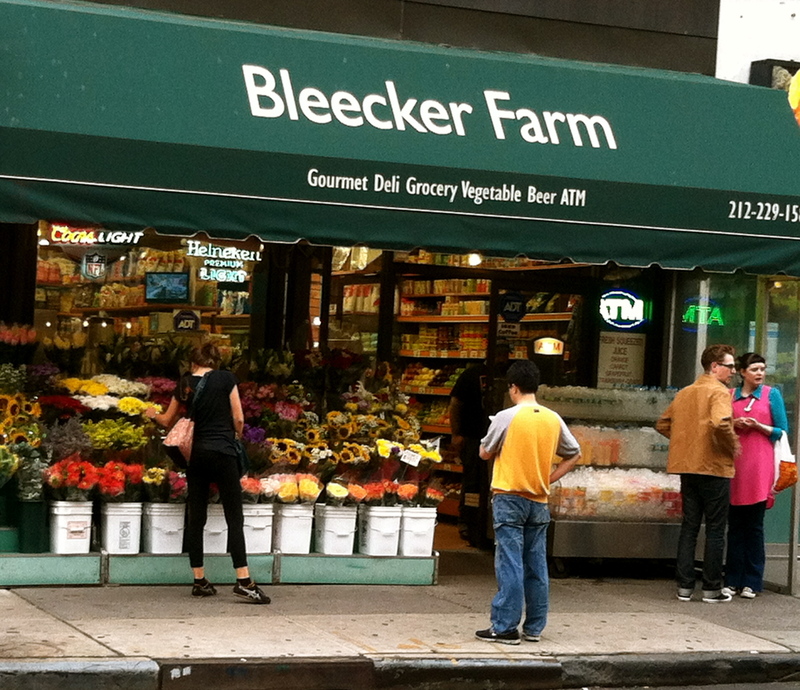 Stay tuned for the Mac & Cheese adventure in the East Village! 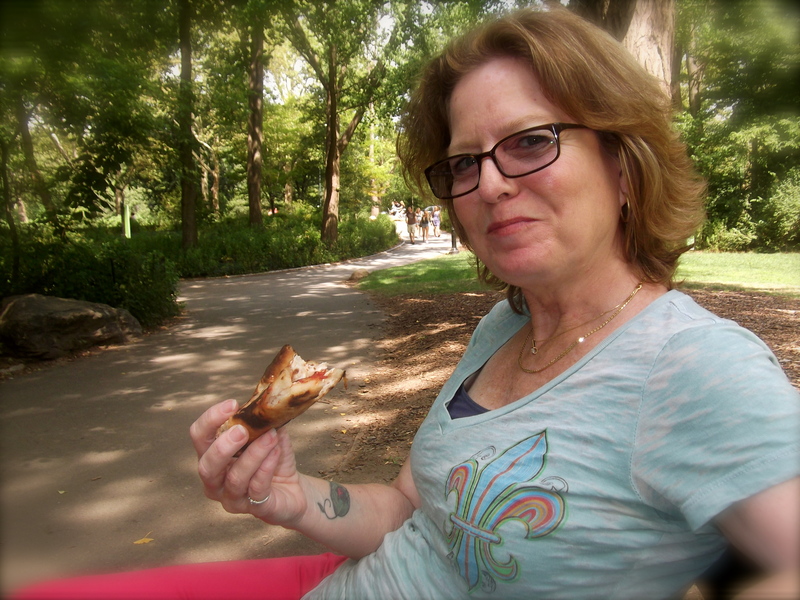 Cold pizza in Central Park. Just like the good old days, yum! 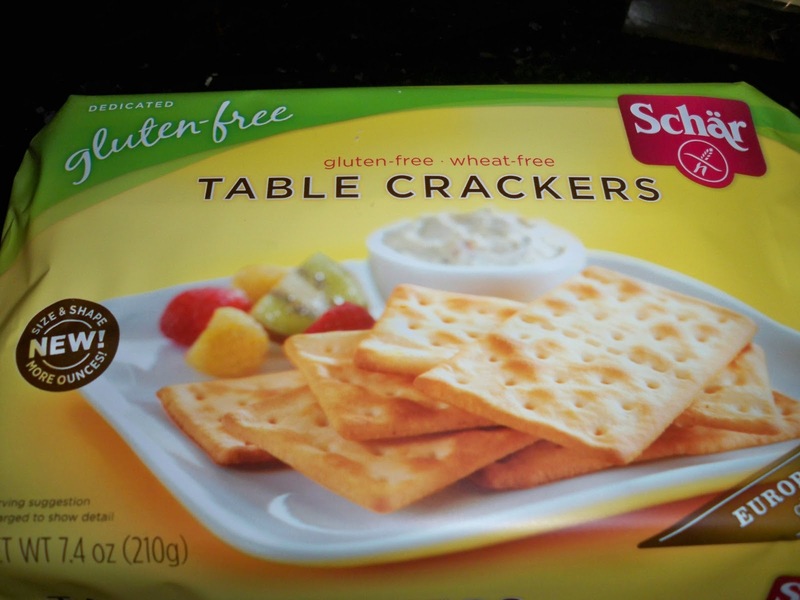 While browsing Sprout’s gluten-free section the other day, I found a section with Schar’s products. These are German products, although they have a US-based headquarters in New Jersey. I had heard of them years ago, but it’s just been a few years that they were readily available and the first time I have seen them in the store. I don’t usually order food online so I was waiting for it to make it to the stores. Next up, the Vanilla Wafer cookies. Now, I’m already a big fan of Glutino’s Lemon Wafer Cookies. They are always in my fridge for a sweet treat. 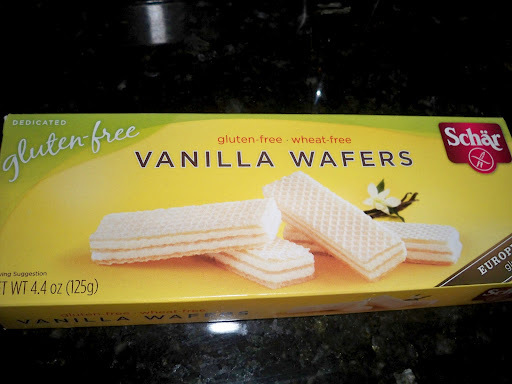 I assumed these would be just as good, but vanilla. Not really…they have a funny aftertaste that lingers after the cookie is gone. 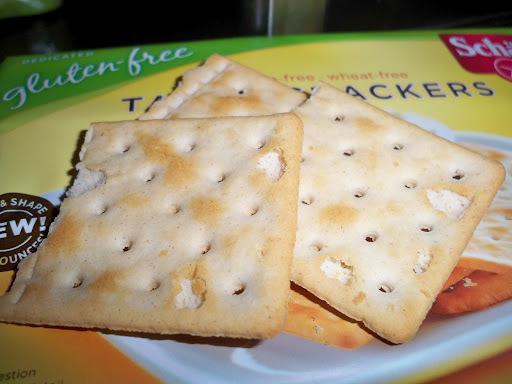 It is nice and crispy and light, just like a wafer should be, but it’s not even close to Glutino’s precious lemon wafers. I won’t be buying these again. 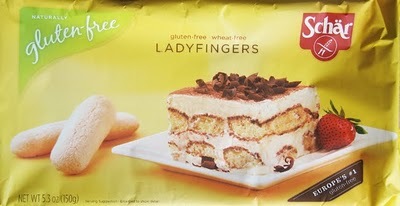 Finally, Schar’s has a Ladyfingers. These are quite large and the photo on the package is what attracted me. They are perfect for tiramisu, or so the package states. The picture looked so good, I had to try them. 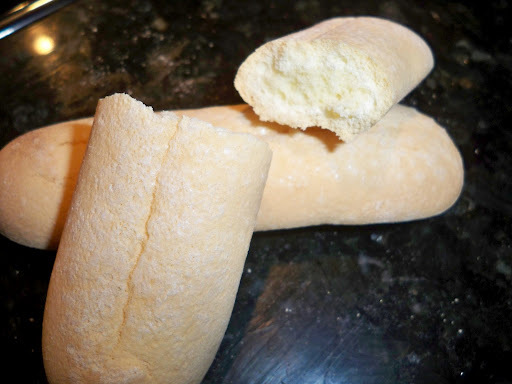 This cookie was a pleasant surprise and is light, fluffy, airy and surprisingly not too sweet. It pairs perfectly with a cup of tea since is not overpowering or too sweet. I haven’t tried the tiramisu yet, but the package has a lot in there so I still have some left to give it a try. I will definitely buy this again since I love having 1/2 of one at night with my tea. It doesn’t feel like cheating or eating too much…just right.